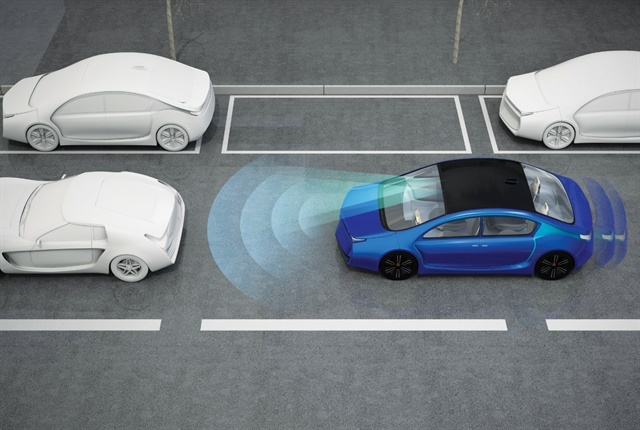 Continuous advancements in vehicle safety technology, both inside and outside the vehicle, will be crucial factors in reducing vehicle accident rates in the coming years. 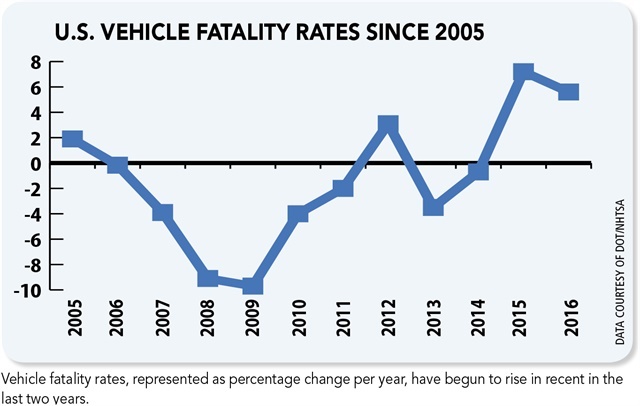 After nearly a decade on the decline, U.S. vehicle fatality rates for the past two years have been on the rise. Factors that have been linked to this rise are distracted driving and an increase in the average miles driven on an annual basis. Looking at in-vehicle technology, continuous advancements and a more wide-spread adoption of advance driver assistance systems (ADAS) will play a major part in making roads safer. According to the Insurance Institute of Highway Safety (IIHS), systems such as automatic braking reduce rear-end crashes by an average of 40%; simply having a forward collision warning system reduces rear-end crashes by 23%. Historically, these safety systems were available only on luxury models, out of reach of most typical fleet vehicles, however, they’re gradually finding their way onto the list of vehicles’ standard equipment, noted Connie Brinkmann, assistant VP of fleet risk management for Enterprise Fleet Management. While safety technology built inside vehicles is meant to reduce the likelihood of a collision occurring while the driver is operating the vehicle, much of the safety technologies that companies offer fleets focus on what can be done to reduce accidents before and after a driver steps into a vehicle. Acknowledging the benefits technology can bring, Rich Tillotson, VP business development at Corporate Claims Management, added that before implementation, a fleet manager should verify what aspect of a fleet needs fixing and then analyze how technology could help correct it. Telematics solutions, a technology service that has long roots in the industry, is one example of a technology that is constantly iterating. The ability to collect data such as speeding, and the length of time that the speeding occurred, has been a vital tool that fleet managers’ utilize in order to keep accident rates low within their fleets. G-force data capturing also helps reduce accidents, according to Emily Candib, assistant director of products management for Merchants Fleet Management. Through this data capture, instances where a driver produces a harsh brake or acceleration can be recorded and used to identify drivers exhibiting potentially dangerous behavior, she added. Edge3, a vision analytics company that has been in the consumer automotive industry since 2005, entered the fleet market at the start of 2018 hoping to iterate on this form of data capture. The technology that it is bringing to the fleet industry uses a deep learning AI-based cloud platform to analyze in-cabin footage in order to identify instances of distracted driving. Video from a fleet vehicle’s cabin is uploaded into the company’s cloud after the driver has finished his shift and is then analyzed to find instances where a driver was exhibiting behaviors that would qualify as distracted driving. As the platform analyzes more footage, it continues to learn and becomes able to better identify these instances. “The way artificial intelligence solutions work is that you train the solutions into different things that you are interested in looking for. Over time the algorithms train themselves, so they become smarter with more video,” said Jon Barad, SVP of business development and operations for Edge3. This technology can also integrate with a fleet’s current telematics solution in order to know when a vehicle is at a stop or idling, in order to prevent the system from flagging a driver while a vehicle is parked. Once the platform has gone through all the footage it condenses the instances of improper driving behavior for a fleet manager to review. Gary Hallgren, president of Arity, a telematics and internet of things company, believes that data will be the most valuable asset in the coming years. Today, the data collected by telematics companies is capable of providing insight such as what the most unsafe intersection in a city is, he noted. With more data in the future, he added, his company could provide insight such as the most unsafe intersection during rush hour, while roads are wet. Or, what intersection has a higher chance of having light hit a driver’s eye when the sun is setting or rising. The massive amount of data that the future will bring will also fuel another aspect of fleet’s future: autonomous vehicles. Autonomous vehicles will require massive amounts of data in order to safely share the road with human drivers. However, when they’re finally ready for real-world roads, they do promise safer driving experiences, free of human error. Barad noted that his company’s technology will also be able to adapt to autonomous vehicles. “For autonomous scenarios, [our technology] could let the car know whether there is someone in the vehicle while it’s driving. In an autonomous world, if the person decides to take a nap while the car is driving, the car needs to know that,” said Barad. The timeline for when fully autonomous cars will be on U.S. roads is constantly in flux. However, GM filed a federal safety proposal to NHTSA in January to put a driverless car with no steering wheel or gas pedal on public roads as part of its commercial ride-hailing service in 2019. Whether GM will gain federal, or subsequent, state approval is the big question, however. Should things go GM’s way, it would mean that fully autonomous cars could be on the road as early as next year.